We Are Chester’s Angela Ferguson and her daughter head to Storyhouse to watch a performance of Alice in Wonderland. Main photo by Mark McNulty. Endless summer holiday anyone? Now, hands up, who on earth would turn down an opportunity like that? Just like Alice, my daughter and I most certainly wouldn’t turn our noses up at the chance of an extended break from school or work. We are captivated and enchanted in equal measure by this charming and thought-provoking tale, brought to life on the Storyhouse stage in the heart of Chester. We’re rooting for Alice all the way when she eschews starting her new school in favour of a chance of adventure with a series of quirky colourful characters. While the rest of us stock up on school stationery and uniforms, Alice (Rebecca Birch) comes up with an ingenious way to delay her new school year indefinitely. She manages to stop time and opts to escape down the rabbit hole on a journey to Wonderland, leaving thoughts of her new school and her new friend Alicia way behind, or so she thinks. And we’re honoured to be travelling alongside her, immersing ourselves in Alice’s rapidly changing new world, complete with memorable new pals. 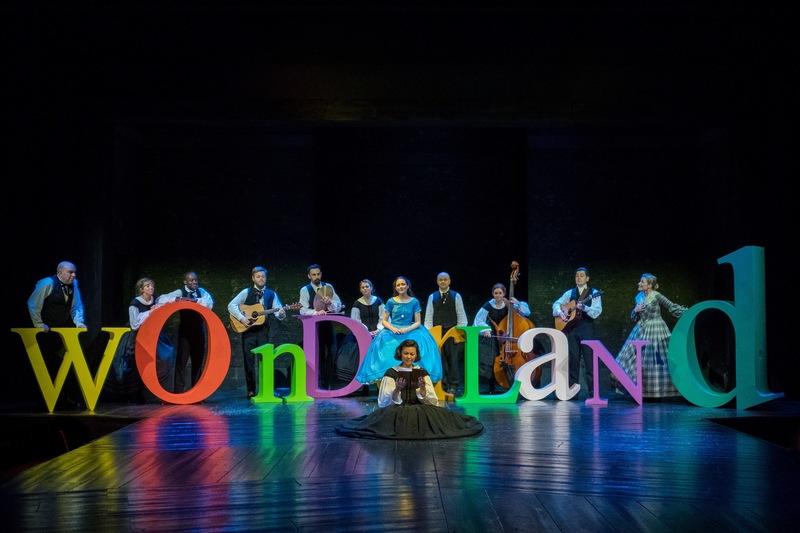 Alice in Wonderland takes a heady dollop of inspiration from the classic Lewis Carroll tale, infuses it with a ladle full of the creative genius that is playwright Glyn Maxwell, and serves up a marvellous feast for the senses that will leave you wanting more. Derek Bond is at the helm as director of this inventive and innovative production, with composer Jude Obermuller and musical director Barbara Hockaday adding another layer of emotional depth to this magical production. Storyhouse has produced a thought-provoking and often humorous look at how we cope with change being thrust upon us. Let’s face it, some of us embrace it, while others drag their heels and some even choose to bury their head in the sand. “I’ll have my cake and eat it!” Alice exclaims in an apparent display of defiance as she savours the thought of escaping from the scary change ahead of her. While some of us might balk at the idea of fleeing down a rabbit hole, Alice senses an adventure is about to begin and sets off to see where it will take her. But will she leave something of her old self behind while she does this? We don’t want to give too much away, suffice to say this is a clever take on the original Lewis Carroll story, with much food for thought. The jittery White Rabbit accompanies Alice to a school room with a difference – where the desks have a life of their own and her anxieties about starting at a new school are suddenly magnified. Will she stand out like a sore thumb without the right uniform? Has she done her homework? Will there be any bullies in school? A cast of crazy and colourful characters lead Alice deeper and deeper into the often surreal world of Wonderland, where she has to face up to a variety of challenges and emotions. There’s the most wonderfully over the top Mad Hatter (Alex Mugnaioni), who channels a charismatic combination of Captain Jack Sparrow and Bill Nighy. 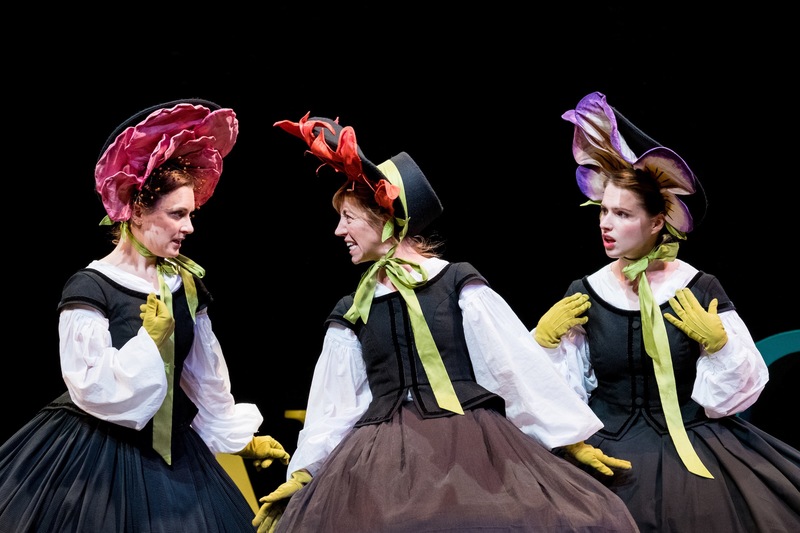 Also worth watching out for are the feisty flowers (Barbara Hockaday, Charlotte Miranda-Smith and Nancy Sullivan), who display real swagger when it comes to lording it over the new girl in school. There are also regular witty asides, delivered Wonderland-style. “A smile is for sharing, a grin is like a packed lunch – you keep it to yourself,” the Cheshire Cat (Caolan McCarthy) confidently informs Alice at one point in proceedings. Alice’s confidence levels dip and soar. How will she fare with all this chaos surrounding her? Will she conquer her fears and find the happy ending – or an exciting new beginning – that she so deserves? We recommend that you head to Storyhouse to find out for yourself. The Storyhouse rep are a hugely talented bunch. Think numerous musical instruments played with great aplomb, alongside a series of gorgeous – and sometimes haunting – songs, and you get a taste of what this production is about. It’s heartening to see that there are also regular local references on this new Chester stage, with the Anderton Boat Lift even meriting a mention at one point, alongside the intriguingly titled Chess-ter Chronicle newspaper. Now that sounds familiar. Alice in Wonderland runs until 9 July at Storyhouse, before transferring to the ever popular Grosvenor Park Open Air Theatre from 15 July to 20 August.